We’ve heard it countless times—the internet is the future. We’ve heard it so long it’s actually taken place, and the internet is now the present, all-encompassing and absorbing, and it is also the past, with total recall and photographic memory to boot. So naturally, a number of industries and activities have to completely reformulate their approach to their audiences in order to remain relevant, engaging and effective. Media is a particularly poignant case of such a tendency, as broadcasting information and content has evolved with the times in hitherto unforeseen ways, and in these rapid times, adaption is the name of the game. Radio, especially, is a medium that has evolved drastically with the advent of newer, better and inexpensive content distribution technologies. The following collection of themes has been developed with such a state of affairs in mind, and themes included feature unique sets of capabilities and features that empower them to handle the needs of commercial radio stations, radio programs, radio circuits, networks, independent radio stations, and even Internet-based radio stations, as the case may be. 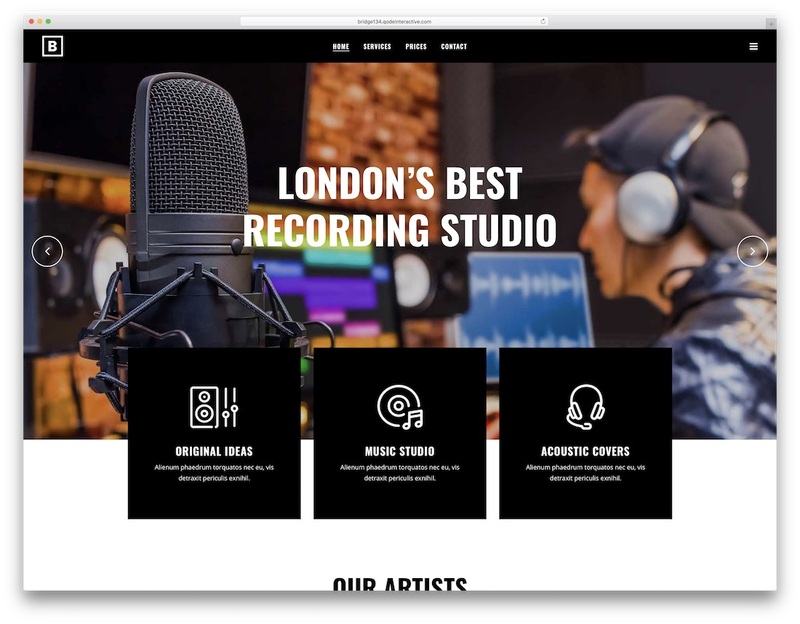 They’re a group of routinely updated, fiercely cutting-edge, flexible and powerful themes that can tackle a wide range of websites, but some or all of their special features qualify them as outstanding for the purpose of radio related WordPress websites. Divi’s incredibly customizable design philosophy lends itself readily to extensive branding, sponsor branding and a host of other nifty adaptations that make the creation of radio station websites intuitive and fast. This theme incorporates all the latest technologies and standards, creating technologically savvy, interactive and attractive websites, every time. Divi lets you quickly get started with several professionally-designed layouts, ready for you to base your pages off of and then effortlessly make them your own with the unique Divi Builder. It is a modular drag & drop solution to page building that requires no coding whatsoever. It also lets you arrange a wealth of custom elements, save your own layout designs and deploy smooth sliders, multicolumn arrays, image galleries and countless other customizable modules to expand the functionality of your website. Offer subscription services for your audience, showcase your featured programs or make a slideshow of your sponsors with Divi. 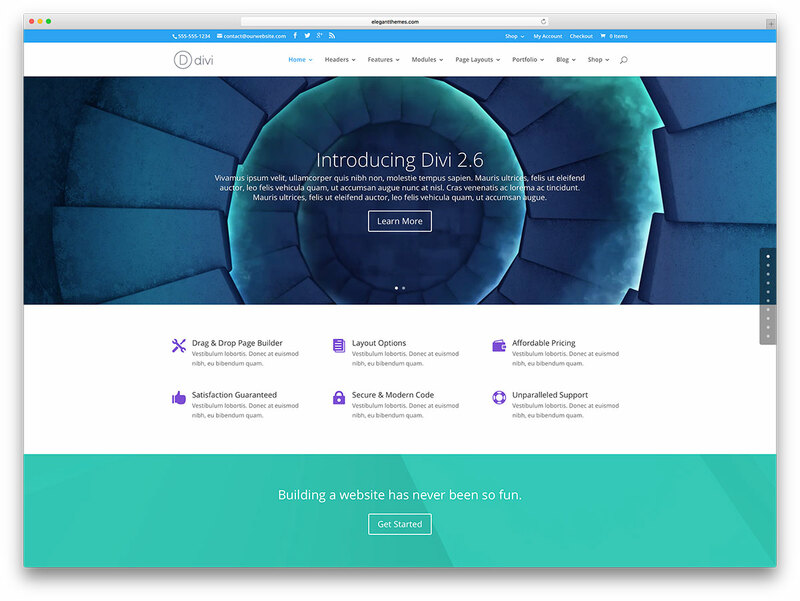 Divi is a 21st century website experience. Is your radio station ready to tune in? For your radio station website, Vice is an ideal choice. This quality WordPress theme includes loads of useful features and settings, each with a purpose of increasing your view count. Of course, a radio station theme will need to play audio files. 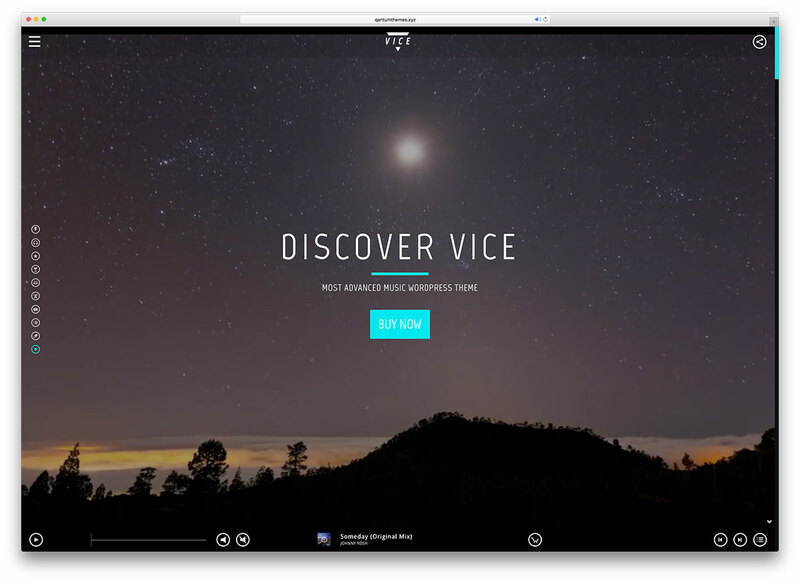 Vice has a unique music player integration, with a playlist function that can feature entire albums. The auto-play setting remains entirely optional. In addition, site owners will be able to open limitless Radio Station Channels. You can set the order of tracks by priority or at random. For novice customers, several informative video tutorials are also available. They can guide you through the installation process, and the production of new releases. You can easily become an overnight expert. Gorgeous slides can showcase content highlights, due to the implementation of the Slider Revolution plugin. Vice is also WPML-ready, and it can be displayed in multiple languages. Should any issues arise, be sure to contact the excellent customer support team. Their representatives are well-trained, polite, and eager to resolve issues. It is possible to create unlimited galleries, and there are gallery modules for every one-page layout. Vice also has caption hover effects, and a special section for biographies. If you prefer a more hands-on demonstration, be sure to access the live theme preview. If you are searching for a superior website theme, look no further than MESH. The flexibility that it offers is staggering, as you can use it in a variety of entertainment niches. 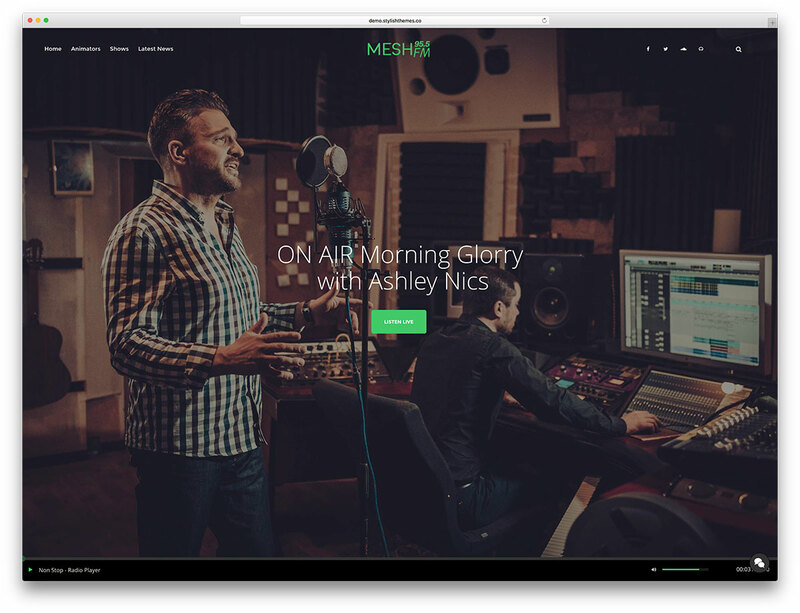 MESH promises to enhance every single aspect of your podcast or radio show. With this product, your main radio page will have a built-in player for all types of sound files. You get to showcase the live shows or compilations of some of your best moments. Regardless of what you choose to feature, the quality of the sound will impress even the most cynical listener. Of course, site owners can create specific sections of each show, detailing the schedule or displaying some information regarding the hosts. The world keeps getting smaller, thanks to the proliferation of the internet, and no business can expect to survive without a strong social media presence. Thankfully, MESH has built-in social network support, allowing you to update your fans or share clips and songs. The theme has a gorgeous and highly-customizable design, and its layout is completely-responsive. Fans will also be able to access your content from the tablets, smartphones, desktop computers or laptops. It will also be compatible with most web browsers. 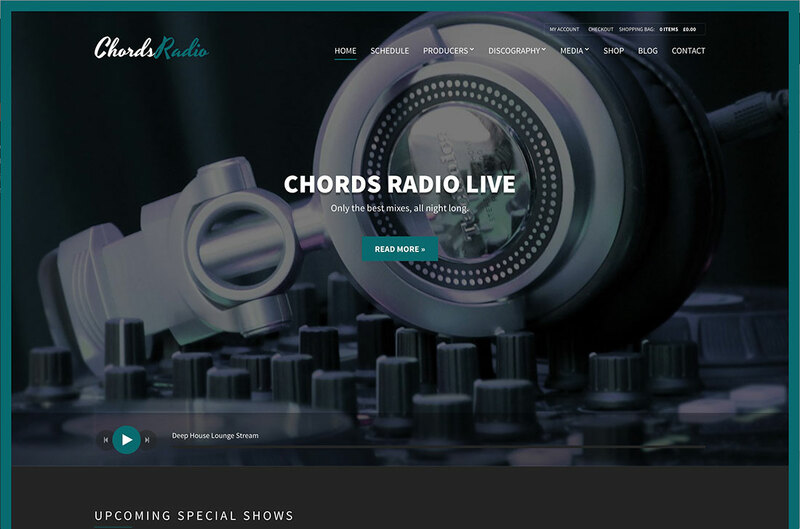 Onair2 is a Radio Station WordPress theme with the purpose of providing a website to serve as an informative channel for people not to miss out on radio news. It also includes awesome music options to entertain and gain audience with each new visit. Onair2 has a simplicity concept for which it uses lots of shortcodes. It has banners and sponsors support, and a very responsive design. Other features include a TOP 10 chart function for you as an administrator to create a track list. It also gives clients visitors the option of MP3 streaming and unlimited channels to listen to. Onair2 is completely mobile friendly. The best aspects of Onair2 are that you can have 11 custom post types, 7 custom widgets and that it supports AJAX. For page design, Onair2 uses Drag & Drop’s Visual Composer. Colors and fonts are fully customizable. It even sets an accordion looking arrangement for playlists. Onair2 uses Parallax, and has a social media sharing predetermined spot in its headers. You will get double header menus and footer widgets. It also features podcasts and lets you share through SoundCloud, YouTube, MixCloud and Show-Connected. Get tuned in every day with Onair2! Are you starting a fresh radio station or plan to freshen up the website of your existing web space? 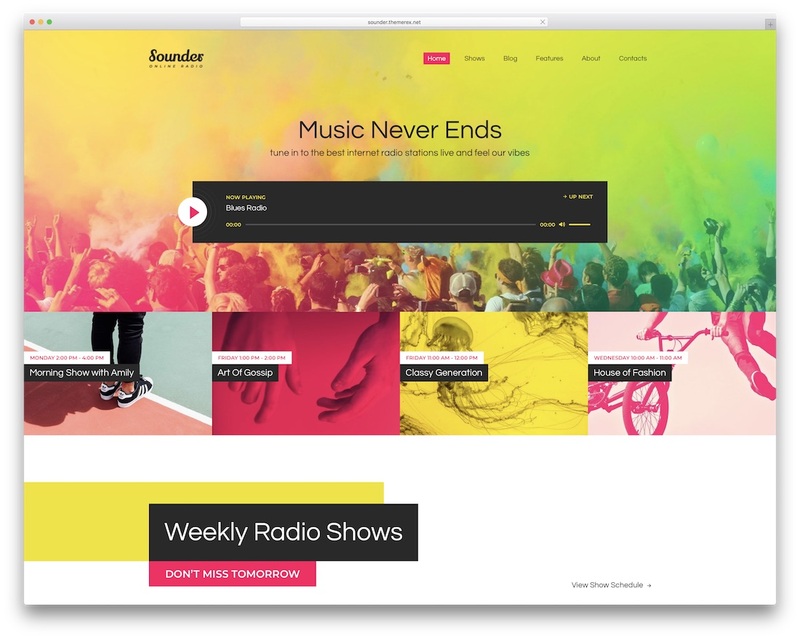 In both cases, Bridge is one of the finer WordPress radio station themes you should study further. No doubt, you can kick things off in fashion with the amazingness this superb tool brings to the table. Whatever your goal is, you can effortlessly achieve it with Bridge. Just by checking the insane collection of demos alone, you will immediately understand how much you can do with it. Bridge is no stranger to serving even the pickiest users. If it does not come with the preferred look out of the box already, you can improve and enhance it further at free will. 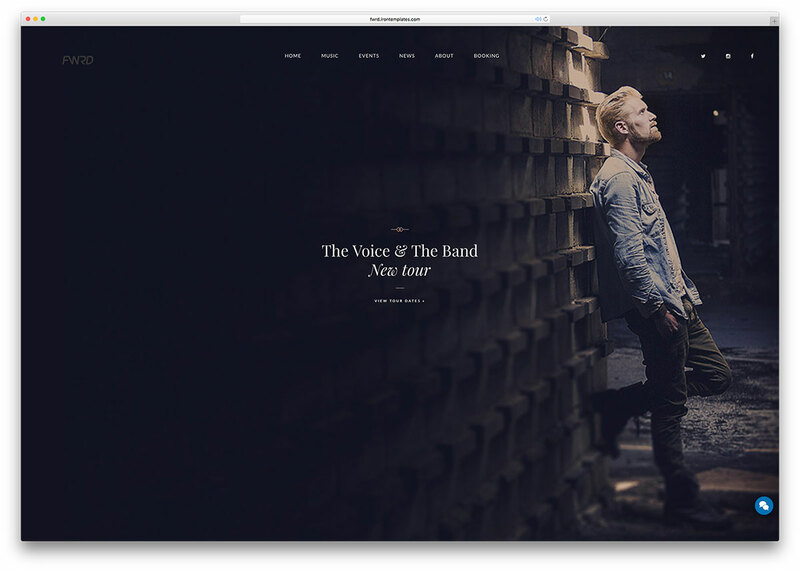 With the intuitive page builder, you will find it a ton of fun editing and altering Bridge’s web design to fit your radio station best. While advertisement claims can be accurate, the most believable praise comes from industry experts. Over 700 developers, designers and web design studios have chosen to use StereoClub, resulting in smaller workloads and higher profit margins. 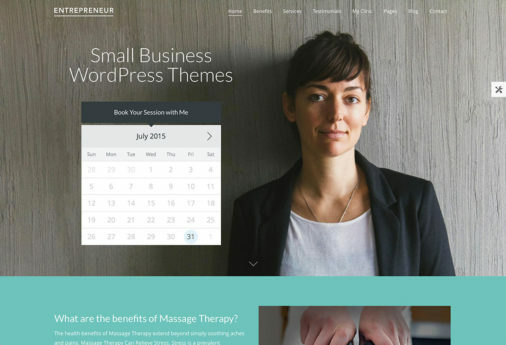 Additionally, this theme is an exemplary WordPress product that refuses to be mediocre. Also, its features are powerful and modern, offering to enhance every aspect of your DJ page. You can use StereoClub in order to promote artists, upload gorgeous images, or listen to your favorite songs. Basically, it turns websites into the owner’s multimedia calling card. There are multiple pricing options, along with Standard and Developer editions. While the core features are present in both versions, Developer editions have extra Layered Photoshop files, HTML files, and they enable owners to use StereoClub for multiple clients and projects. If you have any questions, feel free to consult the well-written theme documentation file. It contains information regarding every feature, and it can turn novices into overnight experts. 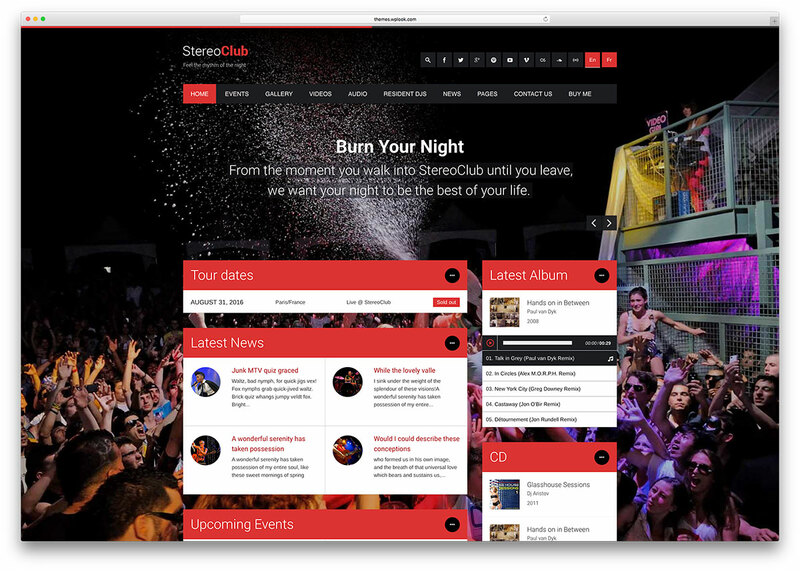 StereoClub can generate multilingual DJ sites, making it easier to accommodate foreign customers. In addition, this theme will look incredible on any device, regardless of its screen size. The layout is fully responsive and cross-browser compatible. You will never have to worry about resizing and compatibility errors. Kallyas comes with numerous advantages and features that make it great for media display. You will find versatility, friendliness and a wide range of options. Additionally, Kallyas is flexible to fit radio stations’ webpages and programs. With unlimited homepages, get a taste of its power, as it features 30+ of these pre-built choices. It uses many different sliders and PSD files on main demo. Play with its more than 100 customizable elements within panels. Kallyas uses a live customizer, Bootstrap framework and Visual Composer as builder. For the design set up, there are unlimited headers and color pallets to play with. Tune your station with its great social media connections! You will also get large documentation, both written and in video tutorials. 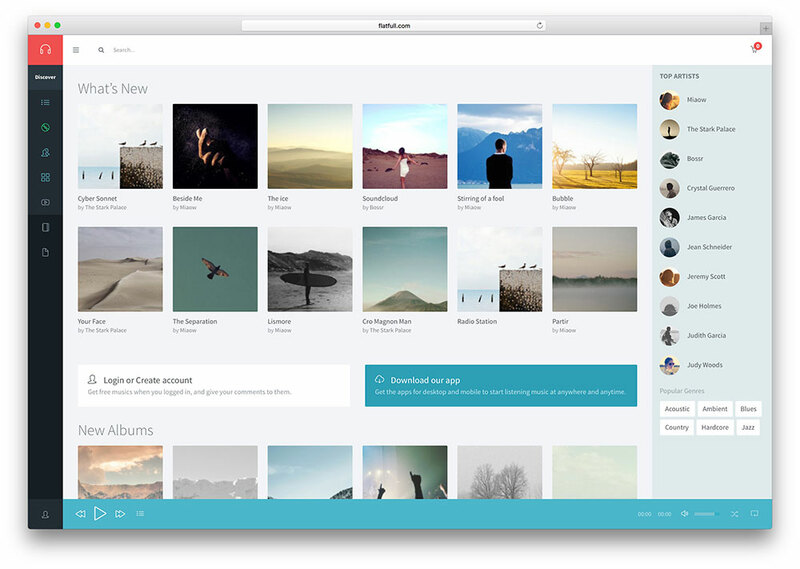 Showcase photo galleries, build awesome portfolios, or simply put on sliders. Kallyas is also WooCommerce and WPML ready. Get the best sound quality and live synchronization, thanks to SEO optimization and Smart Load. Streaming and podcasting is no issue either. Get this theme and set it up with a one-click install… Try out Kallyas now! 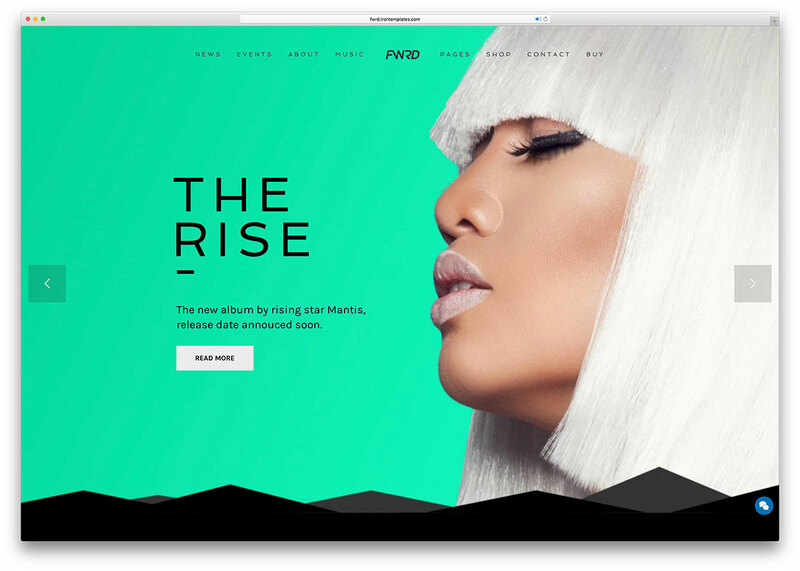 FWRD is not just a visual skin, but an across-the-board upgrade that promises to enhance every aspect of your page. Gorgeous video and Parallax backgrounds can serve as a backdrop for your content, while an accessible Audio player can showcase some of the season’s greatest hits. At any time, you can upload tracks and MP3s, sort playlists, or include reviews and lyrics. You can feature the player on all pages, and not just in the homepage. This is made possible by some excellent personalized widgets. If your radio business also has a merchandising branch, you are in luck. FWRD includes the WooCommerce premium plugin, which allows you to design a reliable online store. For your foreign listeners and fans, it is possible to create a multilingual site due to the WPML plugin. This allows you to expand your target demographic. When it comes to visual design, imagination is your only limit. You can benefit from limitless design options, templates, and layouts. There are 13 custom widgets, and countless fonts and colors. Feel free to experiment with different designs, until the radio site matches your vision. SONIK is a theme built around the concept of modern musical production, and as such, it has been outfitted with incredible resources for musical industry webmasters to easily accomplish any task they set about on. Radio stations will find in SONIK an amazing toolkit, including sophisticated page templates like the Radio Schedule page with extensive scheduling, thumbnail and view options, the powerful integrated Music Player with all sorts of customizable playlists and features as well as native support for MP3 streaming, making online radio stations an easy, breezy matter, up and running within minutes of initial setup. With SONIK’s awesome Top 10 Charts, managing your musical charts is easier than ever before, including fantastic and fully functional SoundCloud, MP3 or YouTube audio preview features. SONIK’s unique Team Members features include shortcodes and templates for your scheduled hosts and presenters around the clock, with custom post types and much more. 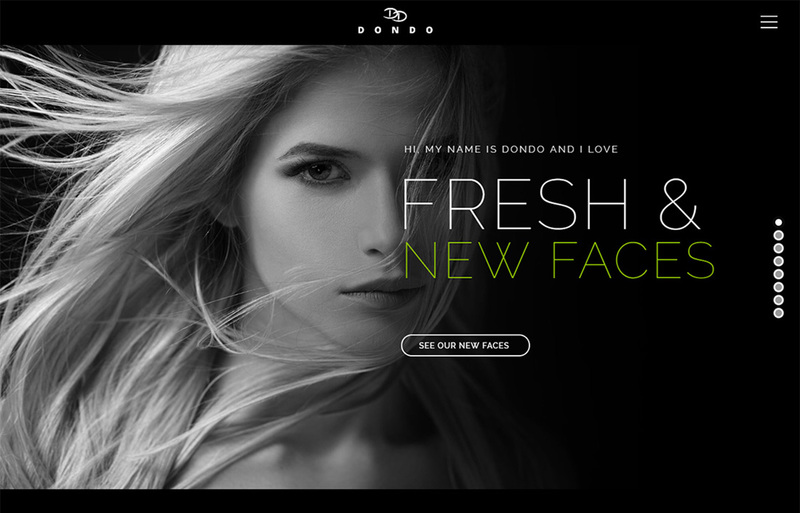 Fully customizable via the Visual Composer, SONIK will match your brand and style instantly and effortlessly. With SONIK at your side, the whole world will dance with your beats! 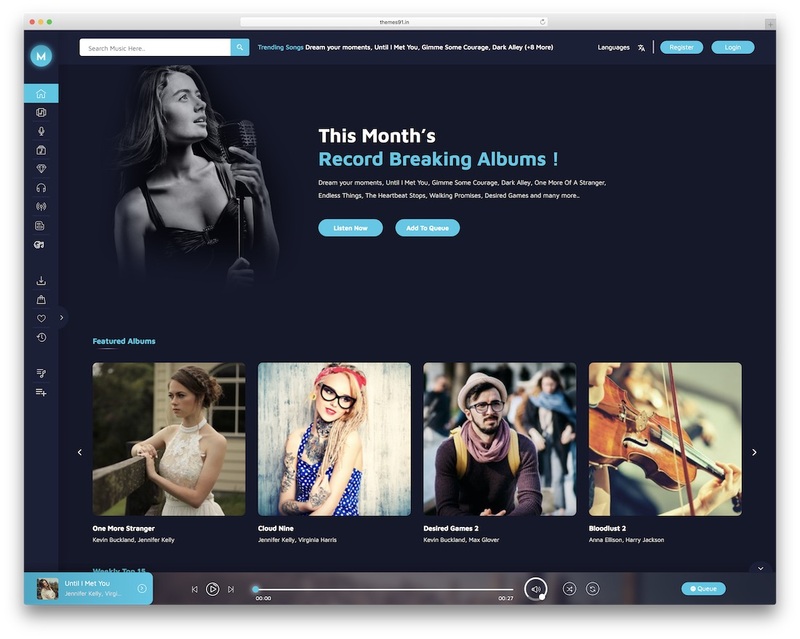 Musik is a powerful platform that offers several custom page templates, a fully customizable user experience, and an entire music playback, distribution and sales platform on top of all this, seamlessly integrated into the theme. 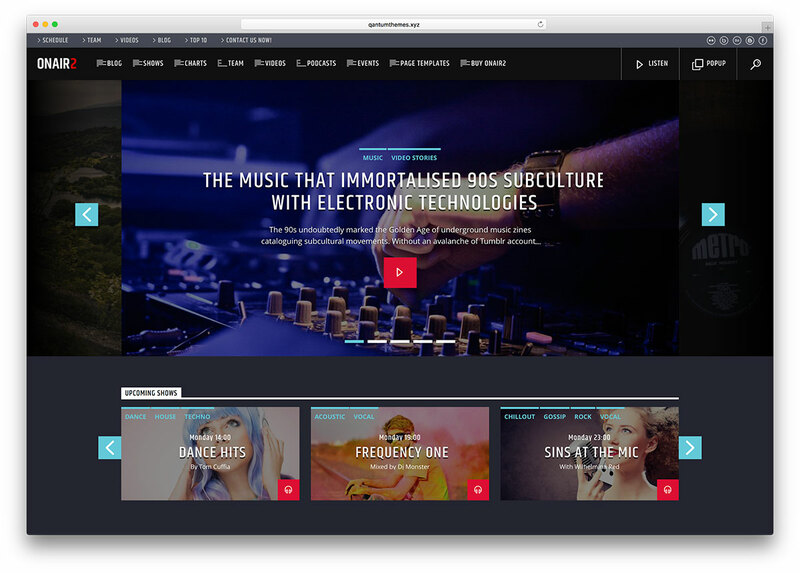 Advanced technologies and boundless creativity combine in Musik to create pitch perfect musical websites, every time. Musik also features a simplified interface for creating and customizing your every page. Dress your site in style as you add incredibly powerful features such as single track or album bundle downloads and sales, musical genre and artist search and organization, audio preview files in multiple formats, the jPlayer jQuery HTML5 Audio player, fully customizable, playlist support and browser player history support, and so many more features they’d make your head spin—turn your website into a one stop digital solution to music for your every user, or an independent record store for small local bands. Start monetizing your musical output today, with Musik! Chords is a very flexible theme that can accommodate all sorts of imaginable websites, but it is finely tuned for servicing websites in the entertainment industry; whether you’re a performer, a band, an entertainer, a talent manager, an event organizer, a radio station or a record label, Chords is the theme that rings just right with your listeners and with your talent alike. Chords is dynamic, current and electrifying, while still being approachable, navigable and intuitive. 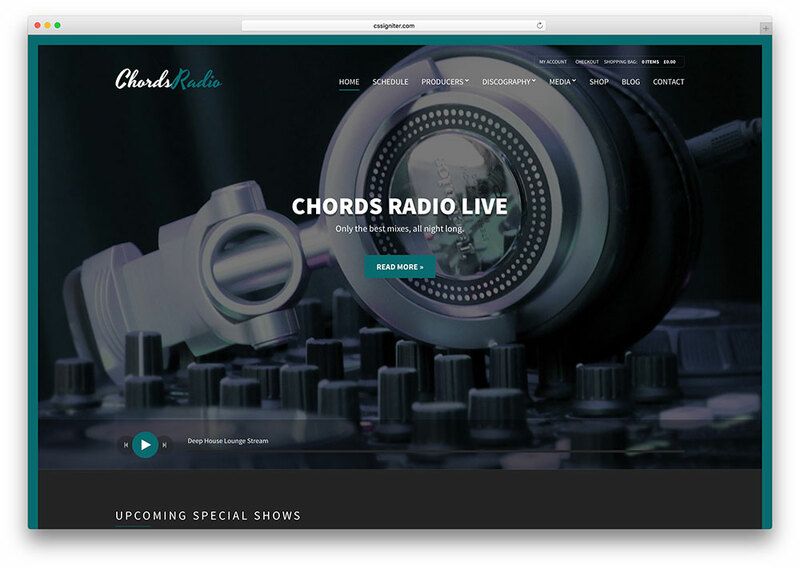 Chords is built on a responsive code that adapts to all devices. Several different page templates, layouts and custom post types are available to construct and fill your website with all sorts of content, elements and widgets that give incredible, unforeseen functionality with entirely no coding whatsoever, including an in-browser audio player that can effortlessly manage streaming audio for radio stations and events, track listings, WooCommerce purchases, SoundCloud, Shoutcast and Icecast streaming music players, multiple color schemes in light and dark shades, a drag & drop interface to simplify all of the above, touch-ready sliders and multilevel menus, Chords is the real deal and will resonate with your crowds. Take it for a spin today! Music Club is an incredibly expressive, bold and stylish, tenacious and flexible WordPress responsive music, event and radio theme, designed with sufficient capacities to competently handle the needs of websites big and small, business and personal, but especially handcrafted thinking of the many needs and requirements of the music and entertainment industries, lending itself for ideal usage by musicians, performers, singers, soloists and bands, as well as event organizers, managers, concerts, parties and raves, and even radio stations, clubs and discos. If you’re in the business of delivering what people want to hear in a fun, dynamic, interactive, energetic fashion, Music Club is the theme you’re looking for. 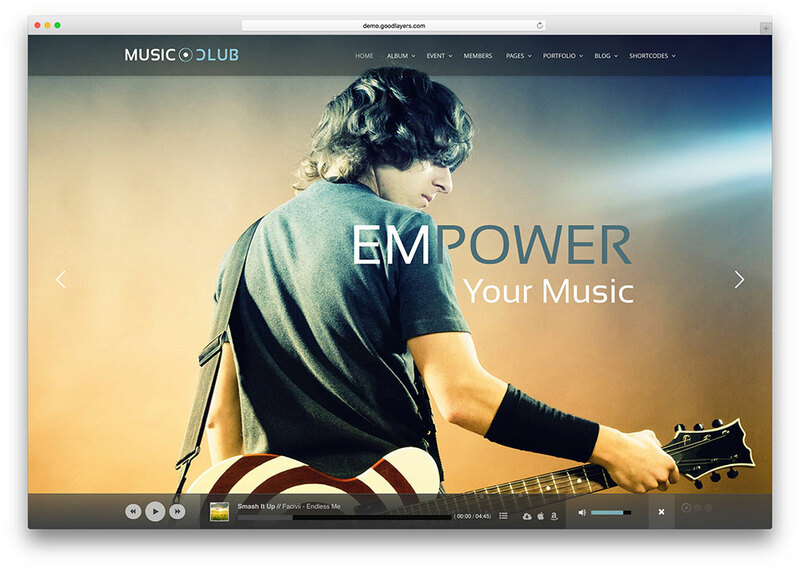 Easy to install, deploy and customize, Music Club involves no coding and no hassle, with premade customizable elements extending powerful functionalities to your website. Such functionalities include boxed in-browser music players as well as more modern floating music players at the bottom of the page, event management system with ticket purchase and up to five ticket statuses out of the box, album management system for loading album playlists, gorgeous Parallax smooth scrolling, the powerful built-in MegaMenu, and total responsivity across all devices, Music Club is the theme for those serious about the beats. 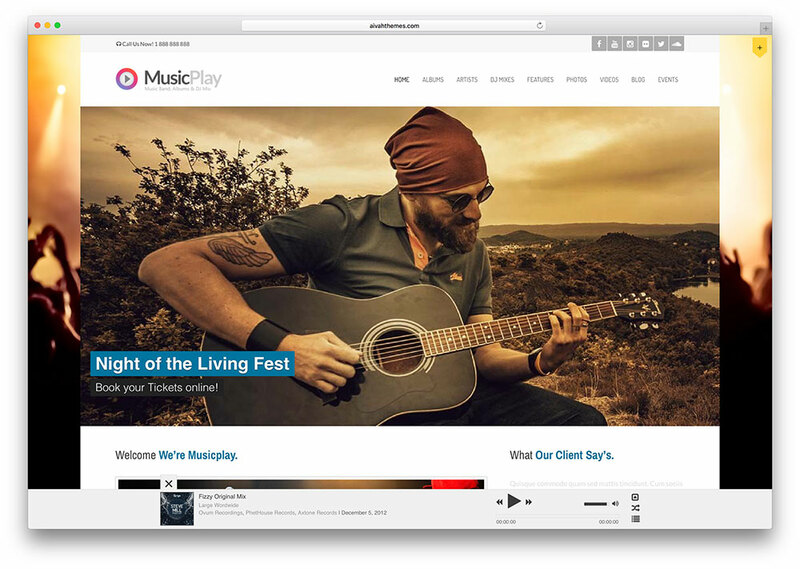 MusicPlay provides an entire framework for your music related needs, from floating audio players at full width to album, track and genre database search, in AJAXified and non-AJAXified presentations, as your plugin needs see fit. Let visitors play music right off your website, whether that music is locally stored, external or even on SoundCloud. You could also broadcast live streaming music and radio stations in a breeze with the integrated Radio Player, compatible with both Shortcast and Icecast. Artist biography templates let you quickly fill out stylish, elegant pages. 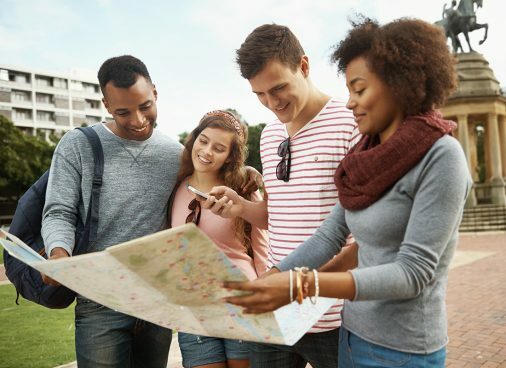 A powerful Events section lets you geolocate, offers calendar functions, countdown times and much more, for your concerts and promotional events to get maximum exposure. Search engine optimization is native to the code, ensuring you top the ranks that matter. MusicPlay means business. Are you game? 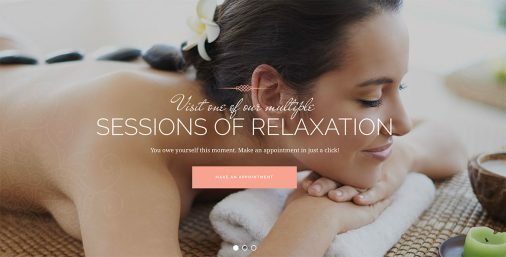 Enjoy a lively and vibrant website look by enlisting the Miraculous theme. When it comes to all things music-related, this WordPress radio station theme will surely exceed your demands. Its layouts are never plain and boring. In fact, they are all modernized and sleek, yet still functional and professional. There is no need to be too focused on building the website as this theme pretty much takes care of that. You will get the latest features in web design that will stand the test of time easily. Additionally, the best thing about Miraculous is that you can modify and enhance the web design according to your unique and original style precisely. Miraculous is an adaptive theme that you can use to get your radio station famous. And there is no need to have any experience in programming and designing; Miraculous is ready for beginners and pros. With Sounder, you will never regret the design options it brings to the table. The developers of this WordPress radio station theme are committed to providing excellent service to their customers. This theme is also loaded with magnificent ready-to-use demo content and features to aid you with the entire process. 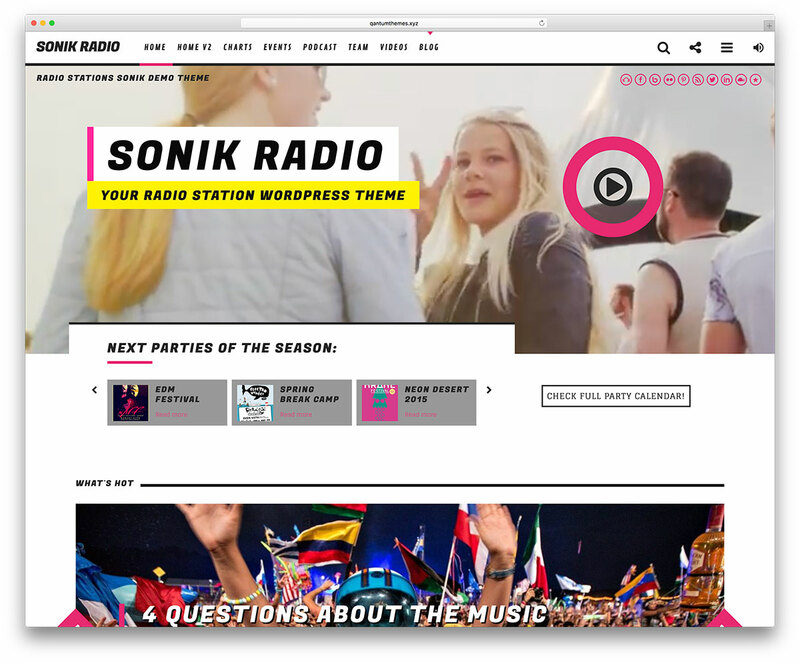 You can now establish a cracking radio station website without a single drop of sweat. Browse between tons of pre-built demos, elements and components based on your concept or theme. They are all made with love that’s why they all look seamless and appealing to the eye. You can also fully adjust header and footer section and create a strong first impression with Revolution Slider. Not only that, but you will also get powerful ThemeREX plugin, SEO tools and a WPBakery page builder. More features are waiting for you, so explore them when you try this theme. Gain access to Sounder and do your thing. what would you suggest for a 24/7/365 news/talk shoutcast/icecast station? Natalie, I would go with Divi or Vice themes. What would you suggest for an online radio station (Original stream from Radio.co but also streaming on Tunein). It’s not a ‘live’ station per se. I need a theme that is beautiful and that can have comments section, should have a way for me to link my stream from radio.co, e-commerce (want to sell t-shirts), ability to add adverts, links to purchase the music from a variety of sources (iTunes/Google/eMusic..etc). Since it’s a world music station, I need the capability to add input music info in different languages (just the info of the song but in Arabic/Hebrew/Chinese…etc). Can i modify the stations on one of those templates? What you recommend? Al of above listed radio station themes are highly customizable. Which means that you can change color scheme, fonts, images, layout and so much more. Hello, Maybe i didnt explain well, i need take the radio and put some differents stations of COLOMBIA. You can use any station you want as themes are not about content you see on demo site but what you actually add on your own. Nothing is set in stone. Hello everybody, we’re gonna start up a online radiostation and broadcast the most popular and memorable songs from movies and tv-shows. I’m looking for a stylish webdesign that breath the air of showbizz, movies and television and let the visitor listen to the station in the most simple ways…. A saw Onair 2 and sonic? Would this be a right choice or do you recommend something els? Thank you for your advice.. Personally, I like Onair 2 but all comes down to your personal preference. Both are very similar themes when it comes to functionality and only the design is what sets them apart. I was wondering if Chords can be used for live streaming? None of themes has this functionality and your server won’t handle it anyway. The easiest and by far most cost efficient solution is to use Youtube or other live streaming service or app and embed a code on your website. I currently run a station which has 65 weekly live shows on rotation which includes more than 100 DJs. Im looking for a theme which includes features to enable me to do the following: allows the djs to have back end access to submit their own content, advertise events and sell tickets to said events, sell music, host a merchandise shop, sell advertising space amoungst others. In your experience, which theme/themes would you recommend to try first? You can use any theme but you must find how to live stream media because WordPress, nor your hosting will be able to handle it by default. You need a 3rd party service integration or else your hosting provider will throw you out the second you start streaming even ones that claim they can handle unlimited bandwidth. Streaming services have a different setup in place that’s why you need to depend on them and not your own hosting. You can, however, embed those services on your WordPress website and any theme and it will look like a part of your site but the heavy lifting will be done by the service. Which template has a backend that’s similar to the Avada CMS as that’s the one I’m used to? What theme is the best for tech blogging according to you? Any of these will do the trick.